I bought a new tool today. It might sound strange but that is unusual for me. I don't buy many tools anymore other than replacement blades when I wear them out. I did pick up a 30 year old lunch box planer a year ago when my old one died. But I don' t feel that counts. This is the first new power tool I believe I've bought in 5 years. Major tool purchases are not fun. They are anguish, uncertainty and stress. The only reason you buy a tool is to accomplish something you can't with what you got. So pre-purchase you fret over whether the direction that a new tool will allow you to go is really the right way to your ultimate destination. Or is it a diversion that will sap resources, time and focus. The larger the tool, both physically and financially, the fretting gets amped up as there develops a level of commitment. Not only do you need the resources to acquire such tool but there is ongoing costs of space, maintenance and opportunity loss. I bought a new tool today. Likely the most expensive tool I've ever purchased. And I bought it at a time when money is the most scarce it's been in my life. For the past few years there have been several avenues of the craft that I know I could veer into as the skills required are within my grasp but I haven't because the time loss of creating those items would detract from what was paying the bills. Certain steps along the path with the assets available would cost an exuberant amount of the total time that could be allotted in order to make stuff profitably. When you are living on the edge potential profitability is paramount. But if I could veer that way there might be new doorways that could be discovered. So today I bought a tool. A specialty tool that only does one thing. But does it well and quickly. And that one thing is the foundation of roadways not yet traveled. 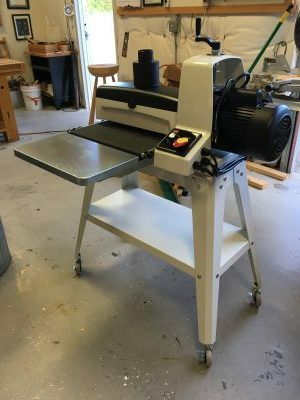 Today I purchased a drum sander. For years I thought this was an idiotic tool. Making stuff smooth could be done with a hand plane, random orbit sander, belt sander, sanding block, thickness planer, jointer, etc... But the more I ventured into trying to increase my income via small production runs that could be sold online or at art markets the more I realized how much time is spent with sanding. Almost everything that comes of the CNC required a hit on the belt sander to separate it from the board. Sending it through a thickness planer was dangerous because small parts could break off and get jammed or explode inside it. Hand planing is impractical because you're just as likely to break the part off as plane it separate causing more damage the good. Random orbits are slow. So that left the belt sander which left much to be desired for quality and time expensed. Yet with a drum you can send it through a few times and the piece will come out flat and separate and there's no danger of the small parts damaging the work or the machine. You can even send the separated small pieces through by themselves to match the other side. It seems CNC's and drum sanders are a match made in heaven when you work with solid wood. Thin material is the basis for items such as: box liners, veneers, Shaker Boxes, fine shelving, jewelry, Kumiko, tools and such. Items that are held in hand and easily marketed online and in art markets. Yet making it is exceptionally time consuming as it comes down to hand work that can induce variations that'll ruin the final product. Yes I can resaw a thick veneer then hand plane it smooth but if that thickness isn't even steam bending will just result in breaking. You could run that kind of stuff through a thickness planer but when you get below 3/8th or 1/4 inch things become dangerous and many planers won't work. You could do all kinds of shenanigans with sleds, carpet tape and such but at what point are you fighting a losing battle. You could relative measure every junction of two boards to get them to match but having consistency would let you match the thickness to a tool instead (such as a table saw blade and Kumiko). Purchasing stock like that on a regular basis would destroy any kind of profit margins. A drum sander was built for thin stuff. And consistent thin stuff at that. Getting a band saw opens up the world of rough sawn material, especially in conjunction with a thickness planer and jointer (scrub and bench planes). A drum sander takes that to the next level. So today I bought a drum sander. I spent money so I could diversify product range of items produced economically. Is that flawed logic? Spend money to save time in what you could do less well without the cost? Why did I chose the model I did? Well I did a lot of research online. Browsed the forums. Thought about what I would do with it. Left room for expansion. Then chose the cheapest one I could find that showed signs that it might be a tool I could use for the rest of my life. Every thing below this point had something about it that told me it likely wouldn't last. That I wouldn't be passing it on. Everything above this point had niceties and capacities that would be great but I couldn't see would enhance the bottom line more or make my experience of using it better. Since this was a major commitment as implied earlier those criteria justified the financial stretch. So here's to the potential of making more shop tools, boxes, cabinets, segmentation, and CNC work. Let's hope it wasn't a mistake. Today, I bought a tool. Ugh... pressure.